As you give gifts this season, please consider giving the gift of dance training to a child in our community. Your support means that more children in Nashville can have access to excellent, affordable ballet training in a diverse environment. As we enter this season of gratitude, I’m grateful for your investment in Rejoice School of Ballet. Because of your generosity, we have many blessings to celebrate as the year ends. An enrollment of more than 130 students, including a new class that serves families from Nashville’s Haitian Community. Performing six sold out shows of “Saam Psalms: Together Songs,” our original ballet exploring slavery and racism to an audience of more than 1,100. The opportunity to tour “Saam Psalms: Together Songs” in the community. In October, we performed the show at Trevecca Nazarene University as part of their “Free At Last” chapel series. Our partnership with Nashville Ballet to increase diversity in ballet. All of our students who auditioned for their prestigious summer intensive program were accepted--4 on full scholarships. 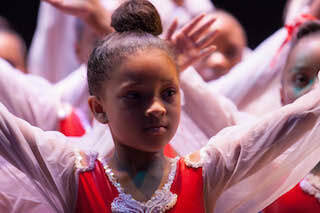 Additionally, Rejoice placed its first student in the School of Nashville Ballet Academy on full scholarship. Your investment in Rejoice in 2018 allowed us to train, nurture and celebrate dancers from diverse backgrounds on an income-based sliding scale that ensures any child who wants to study ballet has access to excellent training. We are also thankful that you helped us provide leotards, shoes and costumes to all of those dancers. In addition to teaching ballet, we continue our work this year by bringing to life the comedic, classic ballet “Coppelia” in February and providing programming focused on health and nutrition, life skills, diversity and spiritual formation. Will you join us in this work? Would you be willing to make a year-end donation to invest in our students and our community? By providing access to excellent ballet education, you provide a Rejoice student with the dignity, skills and imagination they need to become the young adults God created them to be. I believe so much in the power of ballet to transform lives, and eventually our community. I see it everyday in our students and their maturity as they work together in a diverse, safe and loving community. I have a front row seat to the growth and transformation of the young people we serve and want to thank you for making that possible.